Are these cartoony chaps the future of the internet? Microsoft's massively hyped New Xbox Experience is now live and available to download, with a concert by everybody's favourite spoiled brats The Sugababes announced to mark the occasion. You want hype? You got it. Microsoft's own Aaron Greenberg recently declared that the NXE was little more than the "biggest moment in the history of the internet." 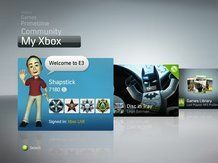 So, as Microsoft ushers us all patiently (and rather insistently) into what it heralds as a "new era of entertainment" TechRadar has taken a quick peek at the avatar-creating user interface and, well, what can we say? It makes the Wii's Mii creation system look slightly old and clunky. Nintendo is going to have to give its Miis a makeover in 2009 to keep up with the big boys. Xbox boss Shane Kim has claimed that NXE is "a big part of [Live's] transformation from a multiplayer matchmaking service to a social and entertainment network." While Xbox Live's Major Nelson has kindly posted his top ten list of things to do with your New Xbox Experience, once you've nailed your cutesy new avatar-self. The only bad NXE news today is that Sony has pulled some movies from the Netflix download service. Hey ho! For TechRadar's full review of the New Xbox Experience hit this link. Right here. Right now.